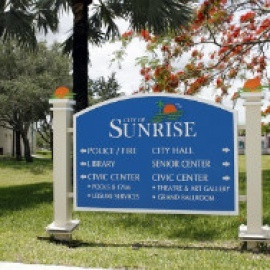 Sunrise is located in Southern Florida, just minutes from Ft. Lauderdale. While in Sunrise, visitors can enjoy beautiful sights such as the Everglades Conservation Area. Sawgrass Sand, a 20 acres park, offers nature trails, hiking, bicycling, and piers for fishing. For patrons that enjoy tennis, the Sunrise Tennis Club offers 11 Hydrocourt Clay Courts as well as 4 Asphalt based Cushioned Courts. Springtree Golf Course provides 67 acres of courses to accommodate golfers of all skill levels. Bank Atlantic Center, home of NHL's Florida Panthers, hosts concerts and shows for all ages while Wannado City offers children the opportunity to role play up to 250 careers in their interactive complex. Looking to do a little shopping? Sawgrass Mills, a 2.7 million square foot shopping complex, boasts 23 movie screens, courtyards with fountains, and hundreds of stores. Retail chains such as Saks, Kenneth Cole, and Neiman Marcus can be found at Sawgrass Mills, along with multiple jewelers, and a new high end section known as the Colonnade which hosts couture and designer fashions. After a full day of fun, visitors can enjoy a variety of dining experience from casual full service restaurants to upscale eateries.